BIG SALE!! PEWTER FIGURINE COLLECTIBLES BIG SALE!! 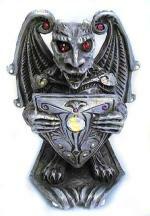 Dazzling and HUGE "King Gargoyle" dressed in his regalia and sporting his fine shield and crest for all to see. He is well studded with 27 superb faceted Swarovski Crystals in Ruby, Amethyst and Aurora Borealis. Darling baby Horned Dragon playing in his treasure chest. It's full of faceted Swarovski Crystals and pearls. His jeweled crown is studded with Ruby crystals and he has Sapphire blue eyes. A great decorative piece for a child's room. A fierce some winged Dragon, a dinosaur look-alike, lords it over his prey. A large skull head with Ruby Swarovski Crystal Eyes. The Dragon also holds a radiant rainbow colored crystal orb. 3.5 ozs. of the Finest Pewter! evokes images of fearful castles and vampires. Red Swarovski Crystals for eyes and a large beautiful faceted round rainbow crystal talisman hanging around his neck. 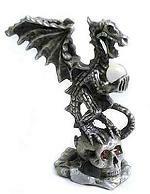 A jeweled horned and winged Dragon stands open mouthed ready to serve as your imperial incense holder. Beautiful swirl gothic type pattern on the holder with 7 lovely Ruby and Citrine crystals. 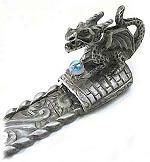 The Dragon has Ruby Swarovski Crystals for eyes and holds an Aurora Borealis smooth crystal orb. A flower at the tip has a citrine crystal center.